Love is in the air! Valentine’s day is a month away and we have several new “love”ly items perfect for class/work parties or a romantic dinner for two. Check out all of our new Valentine’s Items HERE! Just in is this cookie cutter set from Kookie Kultura. The set includes the boy and girl cookie cutters, a crinkle-edge rectangle and a small heart cookie cutter. Absolutely adorable! We decorated these sweet cookies our using royal icing, wafer paper and food-safe pens (for their intricate faces). Don’t forget to browse our new LOOKBOOK, CAPTIVATING CUPCAKE and HOW-TO RECIPES SECTIONS – which are all full of great ideas for the season. Here’s to all things pink, red, purple, cute and or course, lovely. 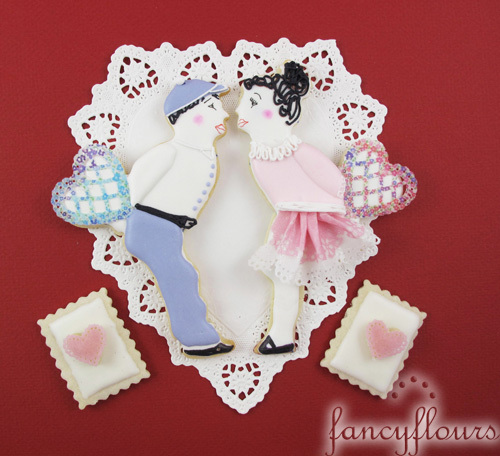 This entry was posted in Cookie Recipes & Ideas, Valentine's Day Baking and tagged fancy flours, kids, kissing, sugar cookies, Valentines by Fancy Flours. Bookmark the permalink.